Oven cleaning stinks! It is time-consuming and the chemicals that are used in most conventional oven cleaners are toxic. 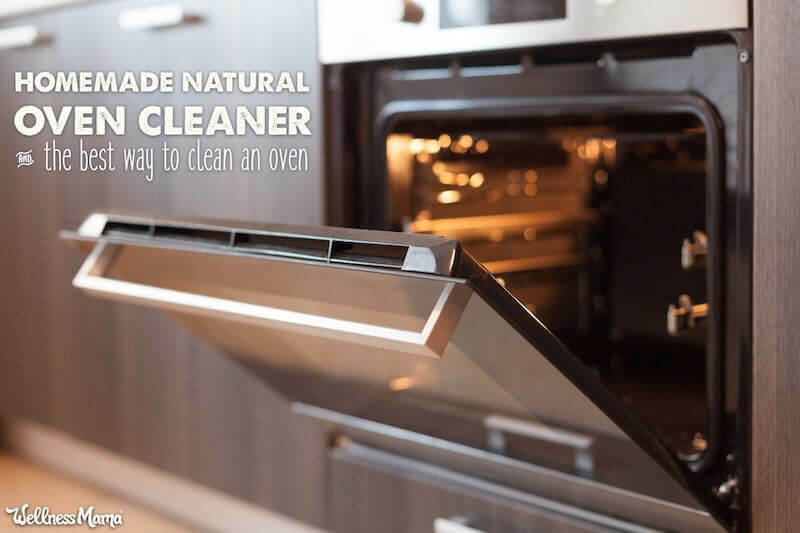 When I started switching all of my household cleaners to more natural methods, finding a way to clean the oven using a natural oven cleaner was at the top of my list. I do not have a self-cleaning oven as some do (more thoughts on that next), so I had to find an easy way to stay on top of my dirty (heavily used) oven. If you are like me, your oven occasionally (or once a week in my case) gets burnt-on food on the bottom, splattered food on the sides, or dried food stuck on the rack. I do not have a self-cleaning oven as some do, and having to wipe down the oven for an hour with good old-fashioned elbow grease (not to mention sticking my head/half of my body in a grimy oven) seemed like a pretty unappealing option. I know, a self-cleaning oven would be one way to solve this problem, but I’ve read that the high heat self-cleaning ovens use may cause fuses or elements to burn out more quickly. There are also some concerns about substances released into the air from the high heat of the self-cleaning cycle. So, for now, my oven is self-cleaned… by me! It can be all too easy to ignore a dirty oven since we can close the oven door and pretend it’s not there (unlike my sink full of dishes spilling out onto the counter…ahem). Still, at a certain point all that baked-on food = a smoky oven you can’t use! I checked for specific oven cleaning products at the store and definitely did not want those ingredients in my oven around the food I was cooking for my family. 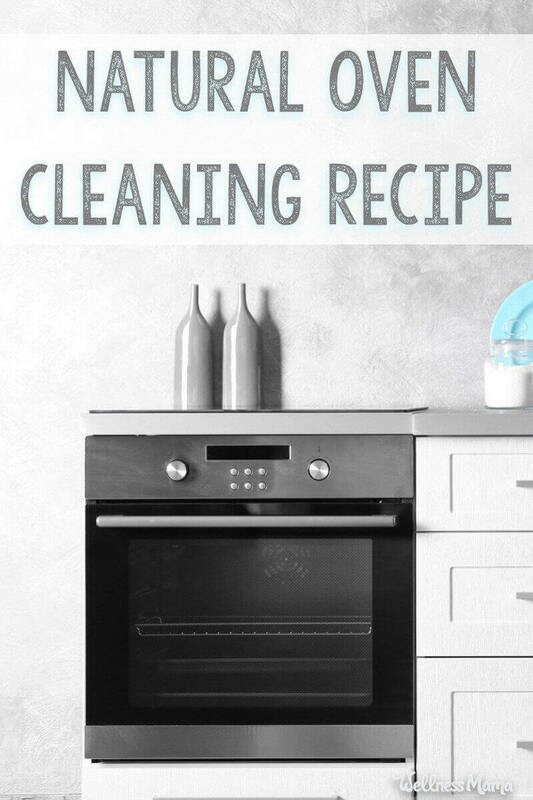 Thankfully, there are a number of easy ways to clean an oven without harsh chemicals or a lot of scrubbing. I tried a variety of natural treatments before stumbling on a cheap and easy natural oven cleaner: baking soda! Though it seems like a simple fix, a quick baking soda paste applied to oven grime is really effective and makes the daunting task of oven cleaning a little easier. All I have to do to get a shining oven is spray the whole oven down with a water bottle so that it is damp and sprinkle baking soda in a thick layer on the bottom of the oven. Spray the entire interior of the oven with water, making sure it is evenly damp. Pour about a 1/4 inch layer of baking soda on the bottom of the oven. If you see any dry spots, mist it with the water bottle until it resembles a paste. After a few hours, simply wipe up the paste with a cloth or an old towel. All the grime will come with it! For really baked-on grime, this may take a couple applications, but it always works and it is 100% natural. Note: I’ve found that it is important to make sure that any residue has been completely removed before using the oven as any remaining baking soda may smoke if left in contact with the heating element! Some people suggest spraying down the oven with some white vinegar as a last step, to break up the heavy paste and make it easier to clean out the oven, but I don’t usually find this necessary. The baking soda method was one of my first natural cleaning discoveries, but since then I found another natural way that I like even better! It is called Branch Basics and be warned… gushing will follow as I am addicted to their products. I’d heard of these cleaners for a long time before trying them (skeptic that I am) because I am fond of my thrifty homemade cleaners and I doubted it could possibly be as good as other people said it was. Turns out, it isn’t as good… it’s better! I feel silly for waiting so long to try it. It all started when I had to cook for a big group and I had a lot of sweet potatoes and regular potatoes in the oven. In my haste, I had forgotten to poke them all with a fork and several potatoes had exploded, Of course, all of the sweet potatoes had dropped their normal sticky mess all over the oven racks and on the bottom of the oven. It was a smoky, awful mess. It was also bad because this was just before Thanksgiving company came and I needed my oven fully functional ASAP. The baking soda method wouldn’t work since it took several hours if not overnight to work. I decided to put my new Branch Basics to the test… I figured if it could clean that oven it could do anything! First, I made a really concentrated 50:50 mixture of the Branch Basics concentrate (it’s a kind of all-purpose spray you can use for just about anything). Then I just sprayed it on the oven. I watched in amazement as the cooked-on junk literally just melted off the sides and the bottom of the oven! Finally, I wiped with a natural bristle brush and some microfiber cloths and it looked like a brand-new oven! It definitely beat the baking soda method. After that you’d better believe I bought a 5-gallon pail of their concentrate and it should last us years ? If like me you could use something that makes cleaning a little easier and more enjoyable, Branch Basics extended a discount to Wellness Mama readers: use the code MAMA15 at this link for 15% off a starter kit for first-time customers. Of course, I still use and love my tried-and-true DIY natural cleaning recipes which are often cheaper and always on hand. Still, who doesn’t need a little shortcut now and then? Plus, Branch Basics was started by a mom who needed natural and safe solutions for home cleaning. (Sounds familiar!) Hear the whole fascinating story in this Wellness Mama podcast. How do you clean your oven without harsh chemicals? 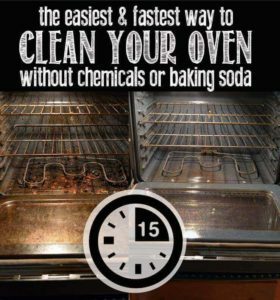 Have you found a natural oven cleaner that works for you? Share your tips below!